Every now and then a record comes along that makes you want to take it into your heart and befriend it. You want to sit down and talk with it, if only you could. You want to make it as personal to you as it obviously is to the artist who made it. War Machine is one of those albums. It's an album that can take me on a journey by candle light. It can enhance whatever mood I'm in, turning both joy and sadness into tears, or happiness into calm smiles and inner peace. Tamara Kent's voice is sweet and lovely, but very human. You can feel the person in the music and not just a well trained diva reading words from a lyric sheet. In an age of genres and labels, this work is a display of pure self. It's unique and personal, obviously emanating from Tamara's own artistic impulses and not from any externally derived goal. Each song is an unfettered artistic interpretation of whatever mood she was in when she sat down to write on that particular day. There seems to be a fine line these days between artists and mockingbirds. Tamara Kent is an artist. Pianos, light electronics and strings, drones, mellow rhythms, harpsichords, bells, and music box tones. 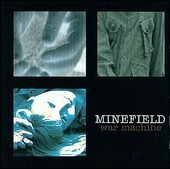 Minefield manages to create a thick atmosphere with minimal instrumentation. That, in itself, is a feat worthy of note. Tamara's vocals are thus lifted up to float above each mix, sometimes bare and sometimes treated with tasteful effects. The album as a whole is certainly suited for those days when you're feeling calm and introspective. Most of the songs are fairly slow, which might leave a person feeling unsatisfied if they're in an energetic mood. You might even consider it monotonous if you failed to realise that there's a time, place, and mood for this album. I recommend a large, rain-streaked window on a beautiful grey day, or perhaps a glass of wine, any variety, a dark room, and a pair of headphones. In any case, you need to be ready to open your heart and connect. If not, you might just miss the point.